ImageFreq began as an experiment with fair use principles in the form of a symphony. The original interface for the symphony proved clunky and so with further processing experimentation an instrument was born. Here is a smaller scale copyright symphony using the basic “instrument” code. While experimenting with the development of the instrument the Deep Horizon/BP Gulf oil spill was in the forefront of my mind, and I found myself experimenting with ways of interpretting images related to the tragedy. 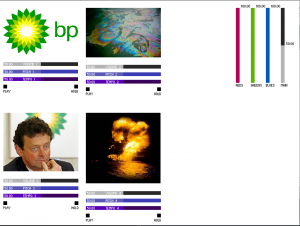 This instrument uses 4 carefully selected images relevant to the BP disaster. In the interest of demonstrating the versatility of the instrument, and as a tribute to my fantastic tattoo artist Amy Justen at Sacred Rose Tattoo in Berkeley, I inserted images of some of her paintings into the ImageFreq instrument. ImageFreq is designed to be performed by someone familiar with the images and the instrument both, though the casual observer can enjoy playing with it’s various sliders even without an intimate understanding of the images or the instrument. There are numerous added functions in the works including verticle pixel sampling, more versitile pitch range adjustment, and the ability to randomly start sampling pixels from any point in the image. I am also interested in developing an interface for the instrument to make it more usable for a wider audience, so that individuals can choose to perform their own images.